I found the above photo posted March 3rd on Twitter under #MobileAL, and thought it striking. Uniquely illustrative of the America few actually see. The image of tranquil Mobile Bay, relatively sleepy downtown Mobile, and then atop—probably due to its novel trimaran hull, it sorta appears to levitate ON not *in*—the somber, gray bay waters like some demonic silver monopoly game piece, a behemoth Cylon-lookin’ war machine, warship USS Montgomery (LCS-8). The LCS (Littoral Combat Ship) program was supposed to make small, maneuverable Navy SEAL-type amphibious strike ships, essentially next gen swift boats with huge firepower relative to their slight profile. Initially the LCS project was promoted as small, easy to churn out quickly, and at roughly 1/6th the eventual $600 million+ cost per Leviathan beastoid the design bloated into. Instead of light, quick, and responsive, truly littoral (near-shore ops, coastal by definition) ships, it ballooned into a heavy corvette after many re-designs. Great enough a shift to warrant re-classimg the ships from LCS to FF, fast frigate, and permanently so in 2019 as even beefier, heavier-armor bulky versions are laid down and launched. Jobs for the city of Mobile are a big positive. And it’s not that i don’t want badass navy warships, I just object to design bloat as much as its parent, mission creep. More importantly, effectively switching from swift boats with serious teeth intended to deter international traffickers and beat down Somali pirates, to a plan for behemoth frigates primarily equipped to take on Big Bad warships, hold their own in ship-to-seaside-fort and ship-to-ship battle vs. some formidable heavy metal, i.e. Russia and the PRC’s growing fleets of high-tech vessels… is indicative of a very different kind of world. Geopolitical expectations have significantly shifted. remember to turn the subtitles on. When Alejandra mentioned to me that even Raul, like me one of two brothers with an uber rare muscle mitochondrial thing, on a ventilator full time and an awesome advocate too, went ahead with the Ice Bucket Challenge, I replied “if only ADAPT had a meme like that!” So together, Alejandra and I brainstormed a new, ADAPTed version of the challenge, and here it is. I offer a different focus for the ice bucketed masses on social media, and try to give voice to the views of many like me in disability rights circles: we don’t want “eradicating neuromuscular diseases” to be the only agenda… quality of life is the key, and every day we’re fighting uphill against systems that hold us back from living the best lives we can. Yes, awareness is great. Yes, medical research is super important, for quality of life too. Politicians who ham it up with an ice bucket after voting to sequester cut the NIH budget so severely that ALS research and all NIH programs had to regroup even more barebones than before shouldn’t be re-elected! Democrats voted for that sequester en masse while the Republicans held out for even more harsh cuts; nominating the lot of ’em for a bucket o’ scorpions challenge would be more like it. Neuromuscular research funding should be auto-approved and Raytheon, Northrupp Grummond, KBR and their ilk should have to pass the hat on social media. Medicaid long-term care still mandates antiquated nursing home care but in-home supports are “optional,” meaning most states offer only spotty or barely-existing home care, and even that is increasingly threatened. Private “major medical” health insurance like Blue Cross phased out coverage of long-term care nationwide in the early ’90s excepting a handful of examples, so unless you’ve purchased a special long-term care plan in your working years to cover full-time care in your senior years, Medicaid is the only place you can turn. Private long-term care plans aren’t available to ALS diagnosed people, preexisting condition y’know, much less sold for the Nicks and Rauls with inborn genetic muscle diseases. This means the most severely affected by neuromuscular diseases like ALS, the Americans who need full-time care the most, have only the dilapidated 50 states/different Medicaid programs for the long-term care that is so essential for both survival and a life worth living. RIGHT NOW these vulnerable groups are unable to get the needed services and supports for the quality of life that they deserve, with their loved ones in their homes, and face worse conditions than they should because of our insane political system. That fight is RIGHT NOW, not four, five generations hence like the potential cures we seek. Standing up for the people in the trenches now is important, awareness of our lives, our struggles, our dignity, is crucial oxygen for us as we face daily battles… Visit www.adapt.org to learn more and to donate. So, I’m a little behind the curve on this one, as it happened in the late morning of October 24th and has been blogged and tumbl’d and tweeted about a bajillion times and now is a week old and largely forgotten… but that’s all right, since my blogging is all about providing long-view context and a unique perspective, not about news. 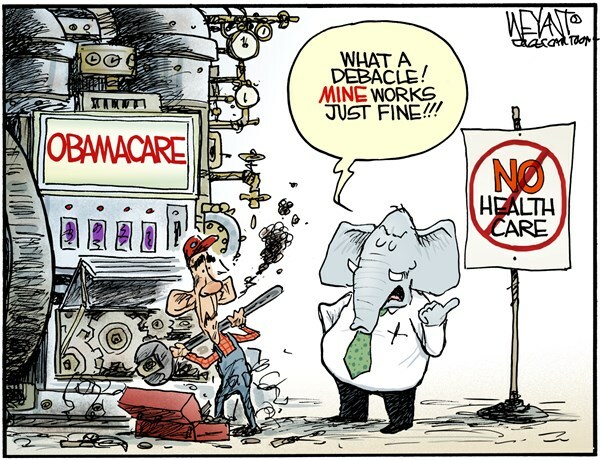 This political cartoon by The Hill‘s Chris Weyant sums up GOP complaints about healthcare.gov and Obamacare so well! what’s the deeper context most news media isn’t giving you? 1) The content of this House Energy and Commerce Committee hearing consisted of questions not grounded in facts about web sites and internet tech, followed by answers just as unmoored from web reality. This spectacle of a hearing/monkeycourt was every bit as indicative of Congress’ tech ignorance as then-Senator Ted Stevens’ infamous the internet is “a series of tubes“ remark, and it ought to be seen in that light. …so, you have these bizarre exchanges where, you know, a member of Congress is asking the vice president of CGI Federal about code inside of the website that isn’t even being displayed and isn’t even relevant to the user, and CG—and the VP of CGI Federal not even recognizing that it’s not displayed and not even relevant to the user. It was this really baffling set of exchanges. It’s like watching my one-year-old argue with my cat. [the House of Representatives]…divided up, as it were, into forty-seven seignories, in each of which a Standing Committee is the court-baron and its chairman lord-proprietor. These petty barons, some of them not a little powerful, but none of them within reach [of] the full powers of rule, may at will exercise an almost despotic sway within their own shires, and may sometimes threaten to convulse even the realm itself. Congressional Government (1885), Woodrow Wilson’s John Hopkins University doctoral dissertation, became popular in the study of U.S. government and politics and has been published in many different editions. Wilson’s scholarship aimed to Having long-since lapsed into the public domain, Congressional Government is available in full online: wikisource hosts its 15th (1900) edition. Obviously many aspects of Wilson’s presidency were problematic to say the least, but that doesn’t zero-out the insights from Wilson’s writings and scholarly works. On his study of the federal government and its flaws, he aimed to be descriptive not prescriptive: “I am pointing out facts—diagnosing, not prescribing remedies.” His diagnosis of the House committee system was that its “barons” are out of control, exercising enormous power nationally without any national or in-House accountability, without checks and balances at all aside from the dude’s constituents’ power to reelect, and without competitive pressure as the chair is given on the basis of seniority not merit. This empowers said dukes and duchesses to act in the shadows, wield power in so corrupt a fashion it’d even make Lucifer blush, all because of the absence of mechanisms to impose repercussions. The structural defects Wilson described in 1885 continue today, only more so, as the committees’ respective scopes of operations has continually expanded, including more and more of the economy (and more industries to shake down for campaign contributions). Joe Barton himself is the epitome of the corrupt committee chairman, just turn over the log and ewwww…. The questions need to be asked, loudly and repeatedly: should the committee system stay as-is in the 21st century? Should their fiefdoms include like half the economy? and if they are to have such a vast, national scope, can we—the people—vote for the chairs nationally on a quadrennial basis like the presidents? or at least subject the chairs to a competitive vote of the Congressmen like the way that the Speaker of the House is elected? Unlike the role of Speaker of the House, however, the committees are not in the U.S. Constitution, just look in Article One. That makes reforming the committees more like the ongoing debate over filibuster reform, it’s about modernizing arcane rules and traditions that are increasingly prone to abuse. We desperately need to address the flaws in the underpinning governing structure of our system. Unfortunately the two parties don’t typically invite discussion of root and branch reforms that may remove some of the ill-gotten gains from the top of the heap they trade off controlling. I’ll conclude on another quote from Wilson: “We know that the machines of both parties are subsidised by the same persons, and therefore it is useless to turn in either direction.” -from p. 27 of Wilson’s The New Freedom (1912) full text available online. “micro-blog,” i.e. send updates to your friends in 140 characters or less. For more, see the Twitter Frequently Asked Questions.